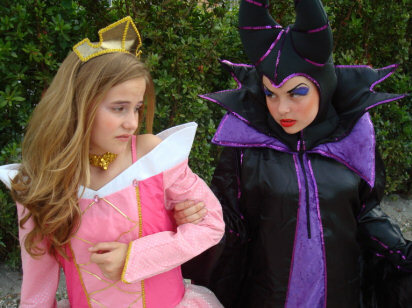 A royal family in seventeenth century France has made a terrible enemy with the evil Maleficent. The witch curses their newborn Princess Aurora to die on her sixteenth birthday when pricked by a spindle, but the good fairy Merryweather eases the curse so that it will only send her into a deep sleep where she might still live if a prince can come to her rescue. Disney modified this tale by Charles Perrault into their animated classic, which is now packaged in a short stage musical for kids lasting over a half hour, but enough time to pack in some magic. At The Theatre Institute of South Florida, that meant having Alba Abrams as Briar Rose/Princess who is pleasantly content being raised in a cottage by her �aunties� (the good fairies) until she is told she must marry a prince she�s never met instead of the charming fellow (Francis Diez) she just fell in love with. Alba also sings a very nice version of the show�s signature theme, Once Upon a Dream. Susana Vasquez is adorable as little Merryweather who plays with the little baby princess and does her best to save her, and is none too sure about the wild plan her fellow fairies Flora (Carela Mendez) and Fauna (Micaela Valderama) come up with. The three of them team up with a chorus of fairies for the enchanting A Little Magic Now scene as the fairies dust off their magical abilities after years of neglect in a scene that includes everything from some Fantasia brooms-and-buckets action to a big kickline. Of course, there is someone else eager to use a little magic, but not for anything nice. Shelby Phillips is a wickedly good Maleficent, featuring a strong singing voice and a strong personality as she works her curses and leads her goons into battle. And with that fun and funky Goon Conga dance, how could the bad guys lose? Directed by AJ Prats, the show moves along nicely with some creative staging and video work to help in creating the magical battles among fairies and witches and goons and dragons and, of course a prince and a princess who prove a kiss is mightier than a curse.